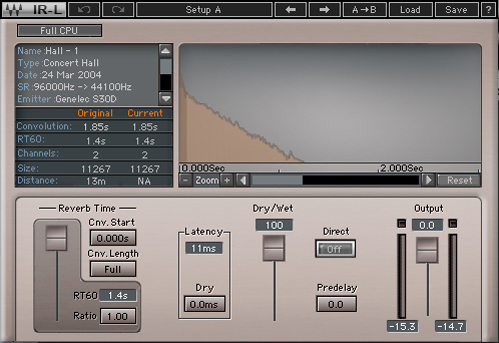 IR-L, Software convolution reverb from Waves in the IR series. With the IR-1 being such an extremely versatile and somewhat hard to use plugin, it's no surprise that they'd create a sister program for those who don't need all that versatility and just need a solid reverb. This plugin has a very similar sound to the IR-1, but it's so much easier to use. The interface is upgraded a bit, and it's laid out in a much easier to utilize manner. You have a setting for CPU mode, an IR graph, a reverb time section, dry, dry/wet mix, crosstalk, direct, pre-delay, gain fader and an output knob. I never experienced any compatibility issues when running this, so I can't comment on anything negative regarding that. I also never read the manual, so I can't tell you how clear that is. I can tell you that the plugin itself is a lot easier to use, so there shouldn't be any real need to use a manual with it. If you're confused about anything, adjust it. That should give you an idea as to what it does. 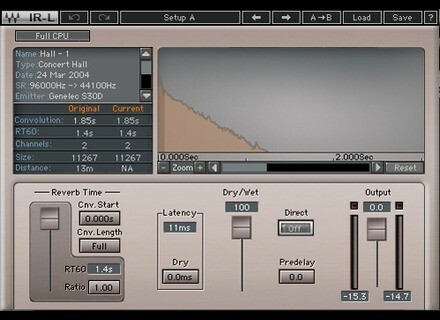 This plugin is as solid as a rock, just like every other Waves plugin out there. They've very well known for having some of the most stable plugins in the music business, and this is no exception. The coolest thing about this is that it has a CPU feature to make sure you're not hogging your entire processor when running this. While it wasn't an issue on my Mac Pro, it could be for those who have somewhat dated hardware. The biggest issue with this is that they're all 32 bit plugins for OS X. I run Logic Pro, and while it has a 32 bit bridge to utilize these in a 64 bit environment, I'd still like to see these be fully 64 bit native. It would help out in so many ways regarding efficiency and clutter. I generally use this plugin more than the IR-1 simply because it's easier to use. 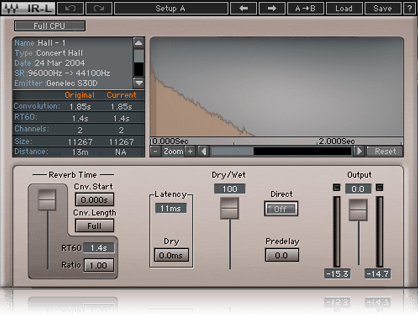 IR-1 can get very complicated, and this plugin is more than powerful enough. I like using this on everything from guitars to drums to vocals. It really does work well on everything since it's so versatile. Give it a go if you get the chance. I'm sure you'll be using it often.